Peacefully on Friday, February 15, 2019 at Peterborough Regional Health Centre, in her 76th year. Beloved wife of Charles. Loving mother of Dana (Michael), Steven (May) and Tracy (John). Cherished grandmother of Andrew, Shane and Zein. Devoted daughter of the late Leo and the late Violet Peebles. Dear sister of the late Wayne Peebles (the late Pat), Patricia (Jack) Naish, Richard (Helen) Peebles and James (Brenda) Peebles. 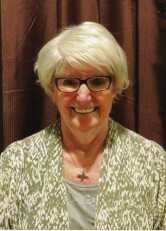 Gail will be sadly missed by her nieces, nephews, her friends at St. George’s Anglican Church in Grafton and her friends from Grace Church in Weslaco, Texas. A memorial service will be held at St. George’s Anglican church on Saturday, May 25th at 11am, with visitation from 10-11 am. Interment Castleton Cemetery. Donations to Doctors Without Borders or St. George’s Anglican Church would be appreciated by the family. Condolences received at www.MacCoubrey.com.